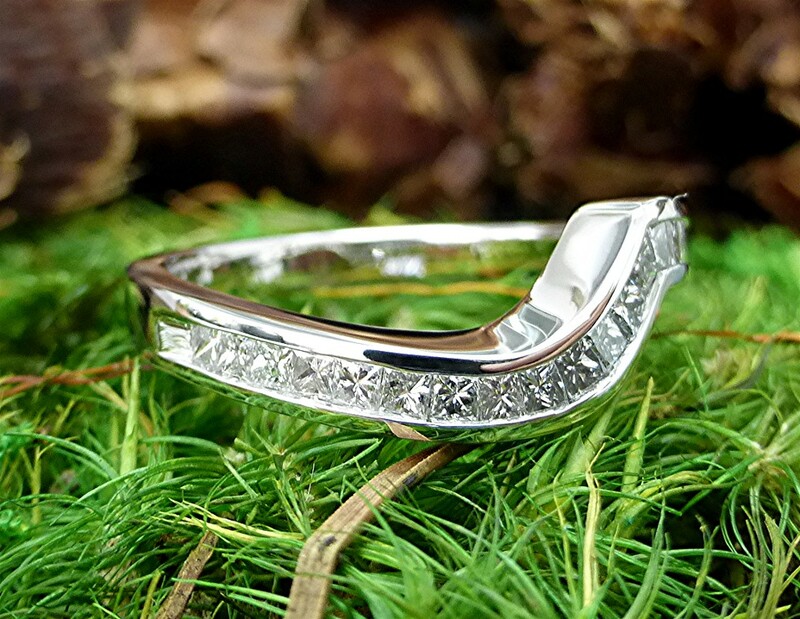 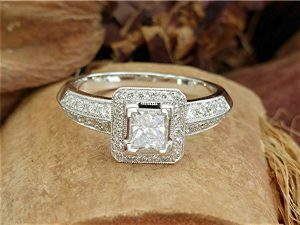 14k gold matching band with 18 special cut channel set diamonds weighing 0.48 carat. 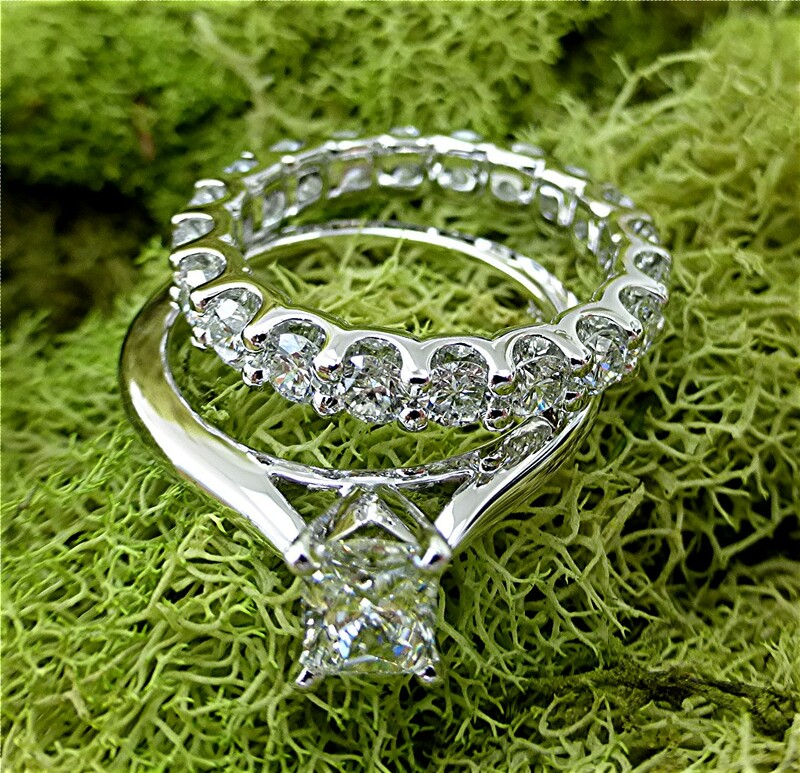 14k whit gold ring with two rows of bead set diamond on the shank and halo for 6.6mm round center stone. 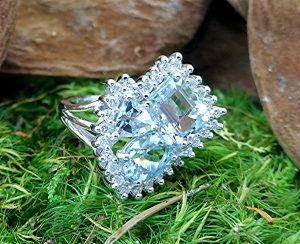 Total diamond weight is 0.46carat. 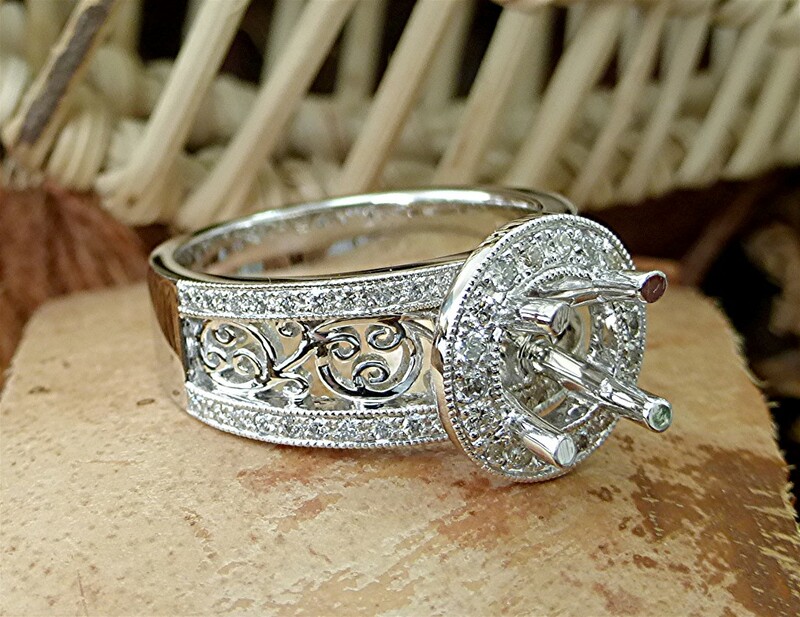 Filigree design on shoulders and mill grained edges. 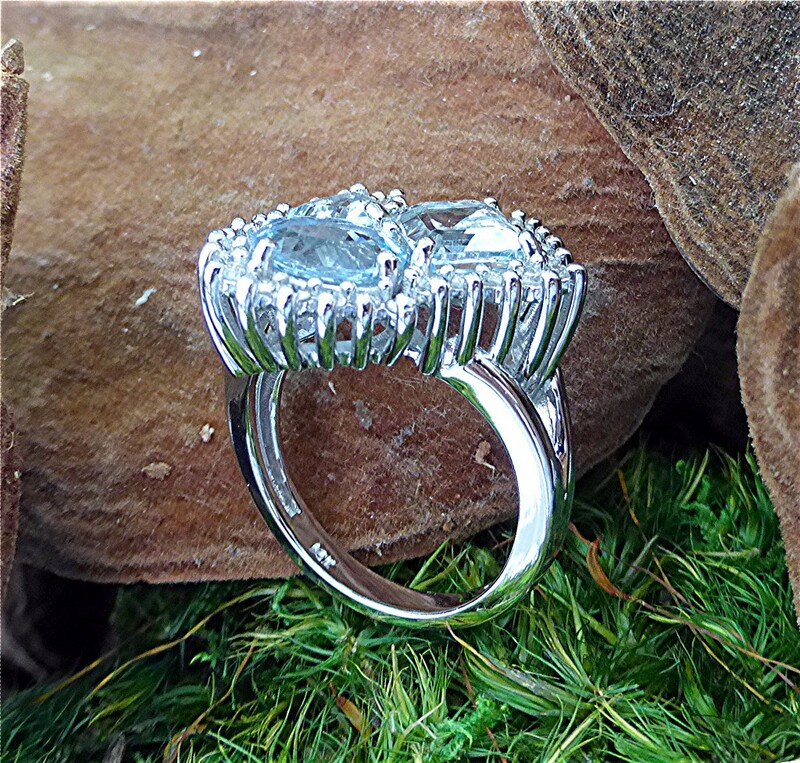 8X6mm center stone is surrounded with genuine natural round and baguette cut diamonds. 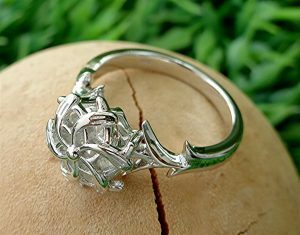 Also top of the shank is pave set with graduated round diamonds. 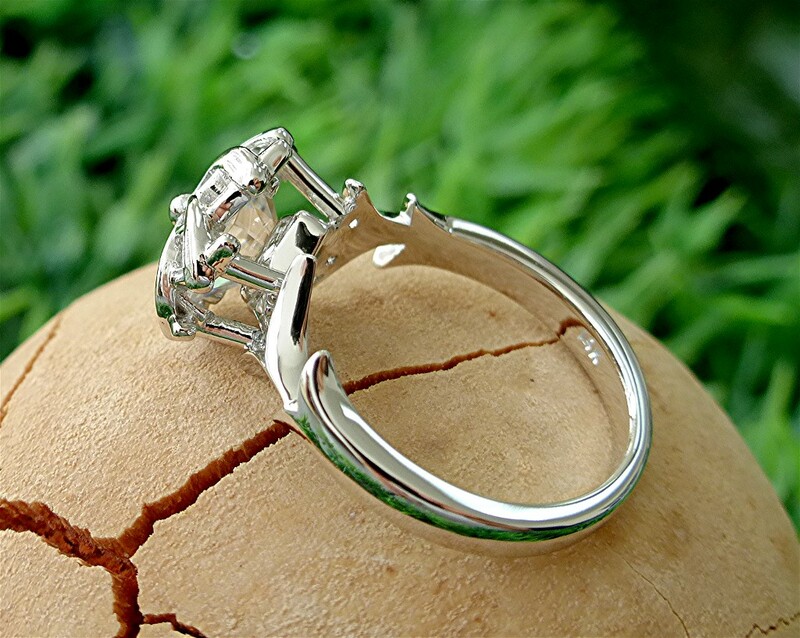 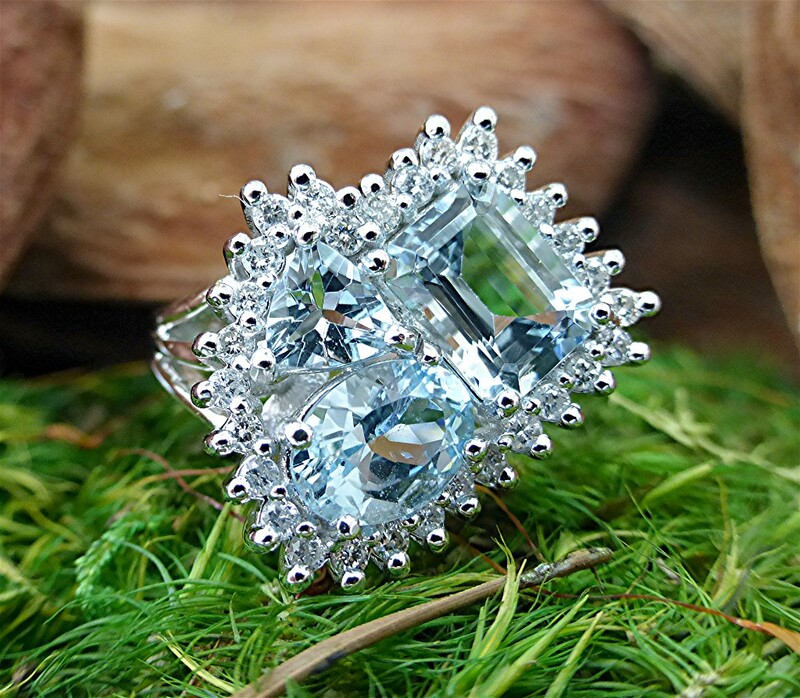 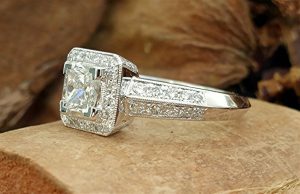 Total of diamond weight is 0.50 carat. 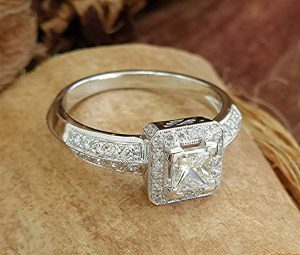 All edges of 14k white mounting is mill grained. 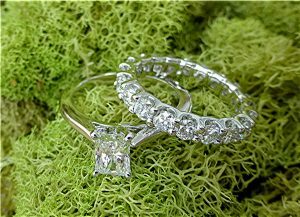 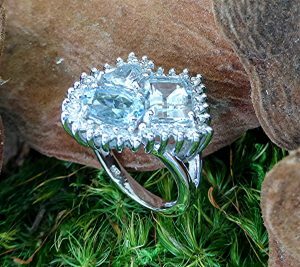 Three emerald cut, trillion and oval shaped aquamarines are surrounded by twenty nine round prong set diamonds for total of 0.46 carat. 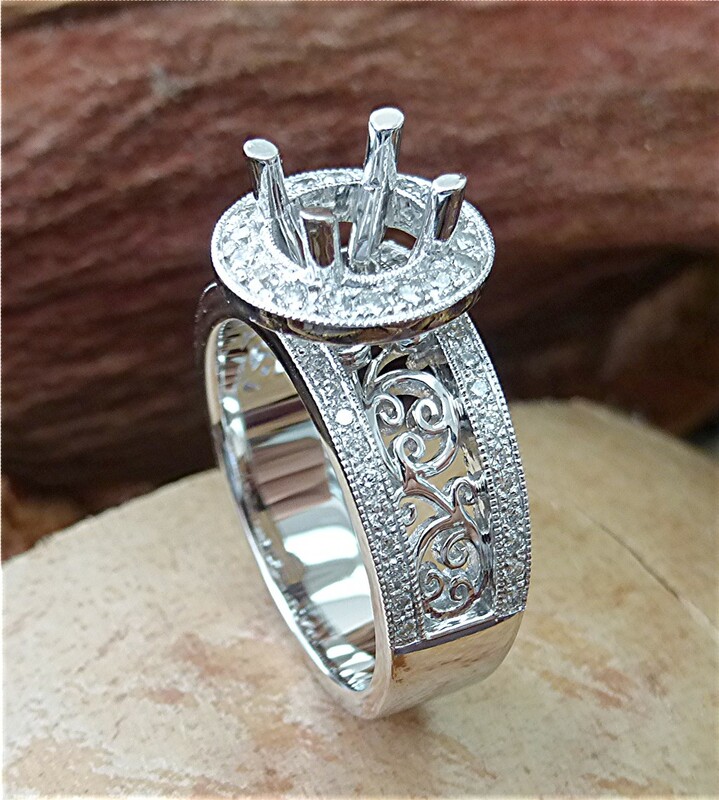 Mounting is 14k white, finger size 6.5. 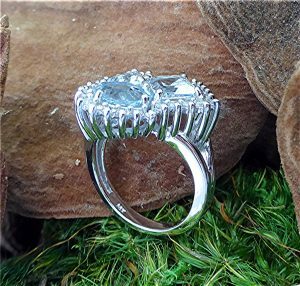 Center diamond is 4.8mm large princes cut diamond set in 14k white gold mounting with 52 round brilliant cut diamond totaling 0.47 carat. 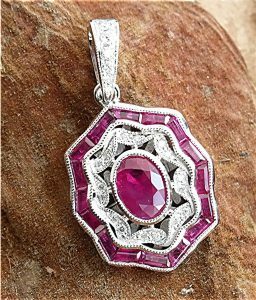 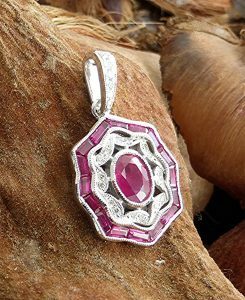 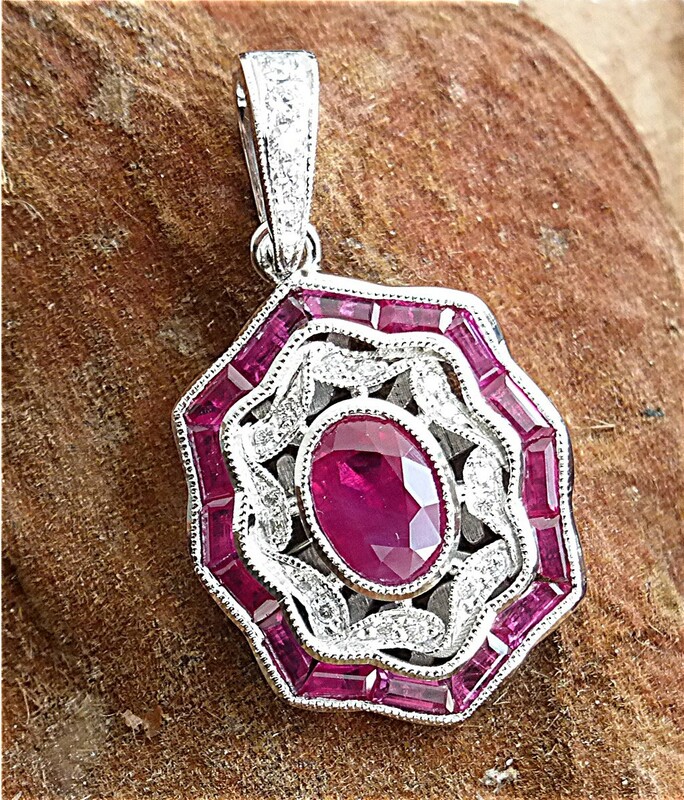 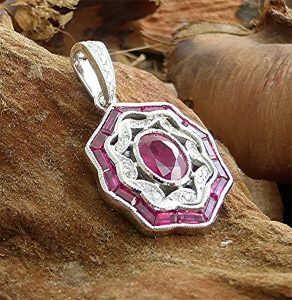 Channel set 16 custom cut baguette rubies weighing 1.39 carat and 1.1 carat oval ruby in center surrounded with 22 pave set RBC diamonds weighing 0.15 carat. 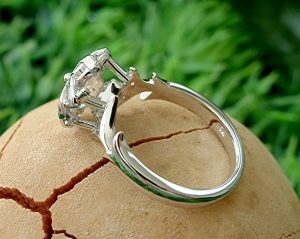 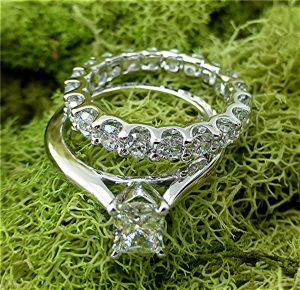 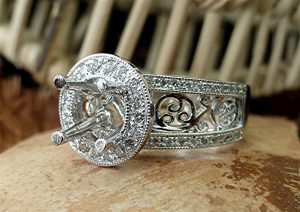 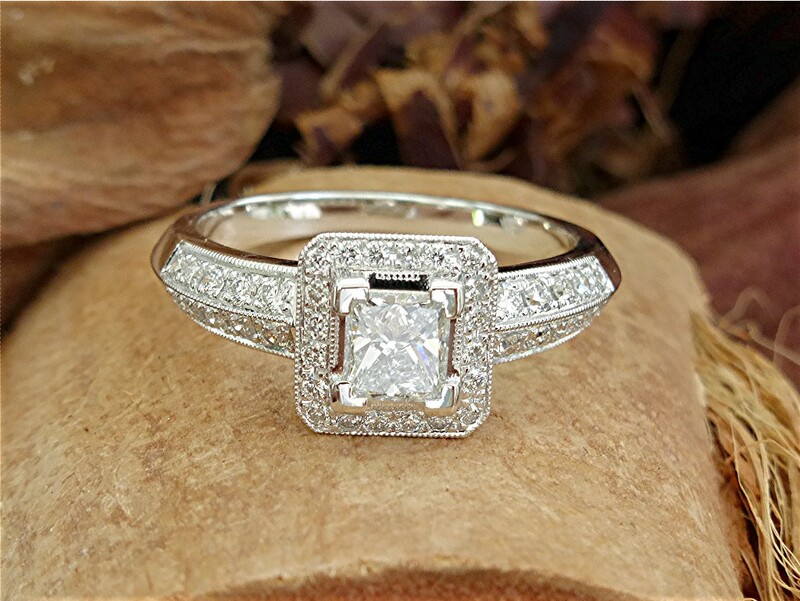 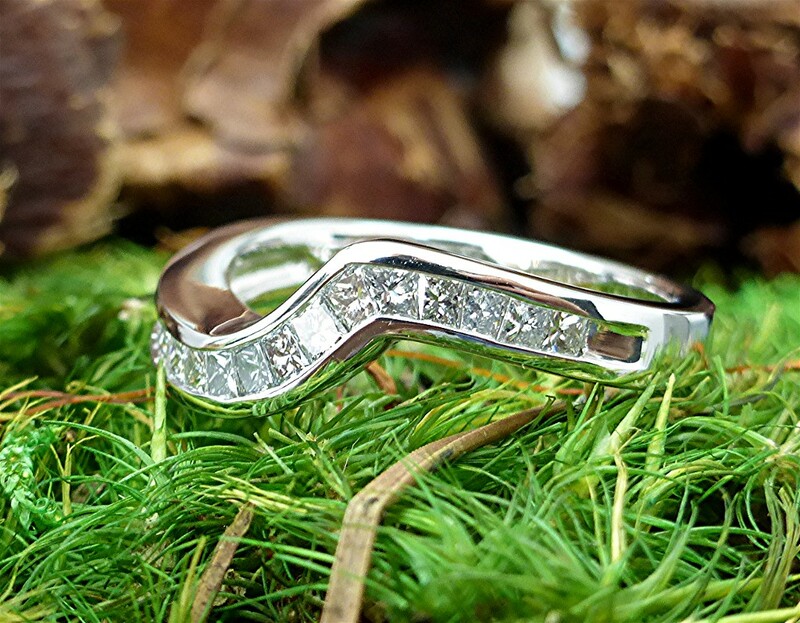 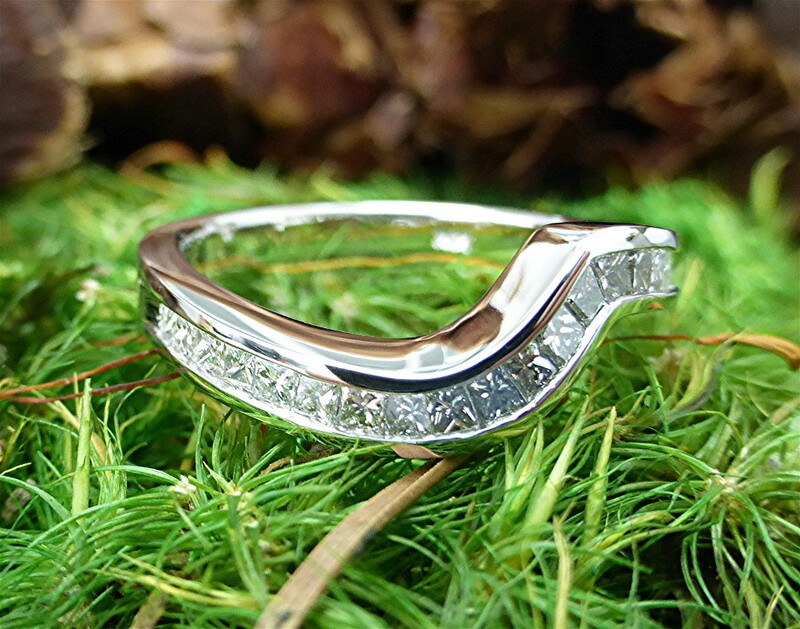 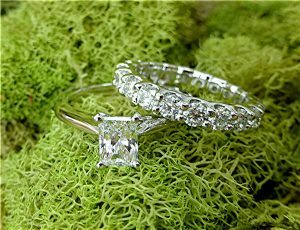 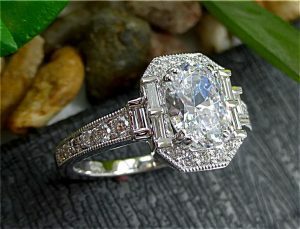 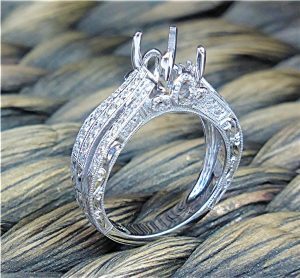 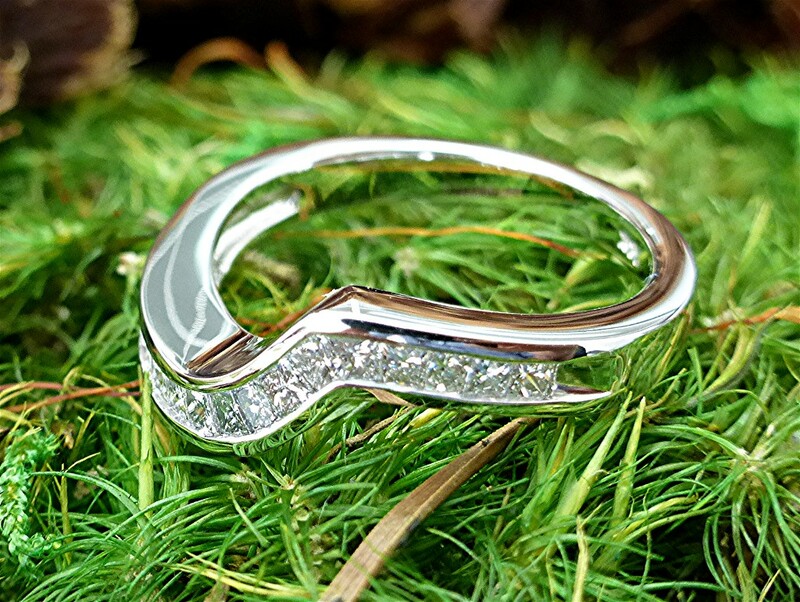 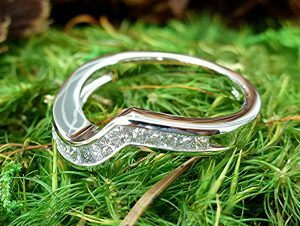 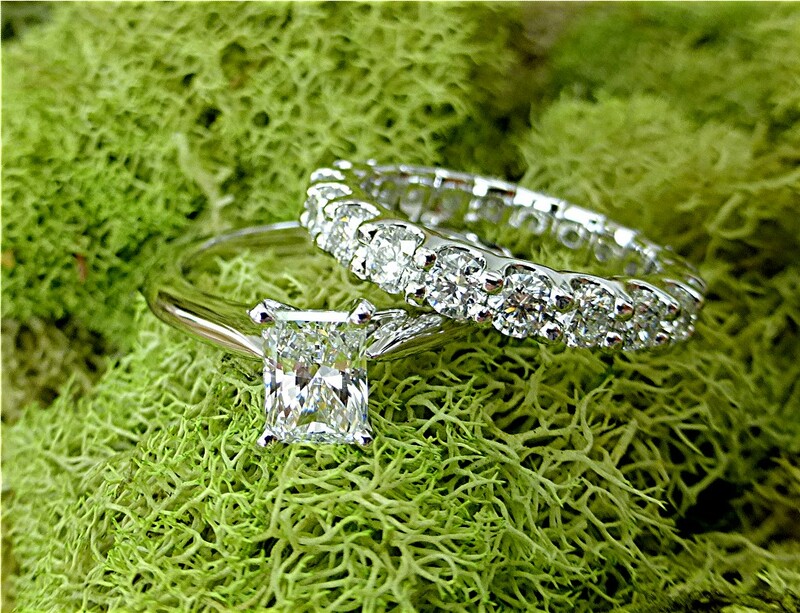 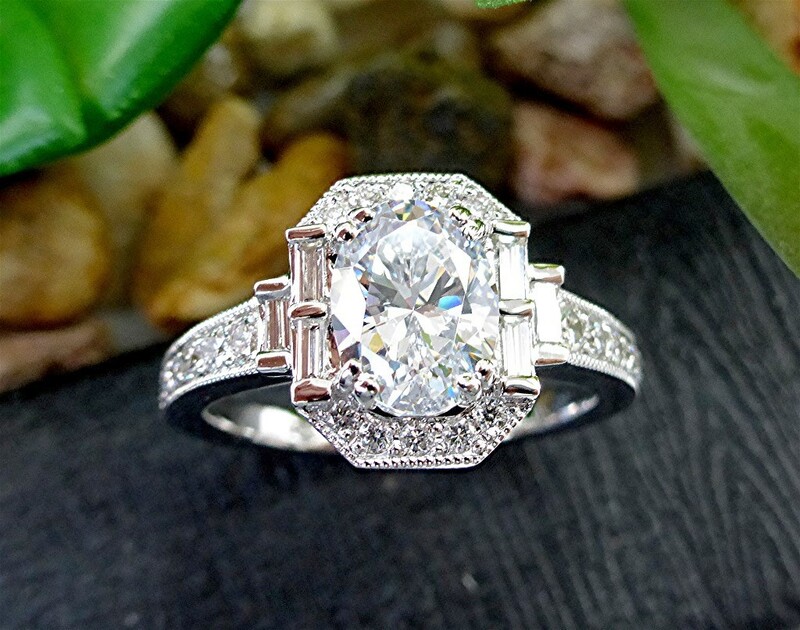 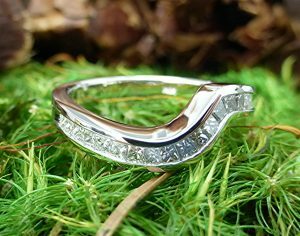 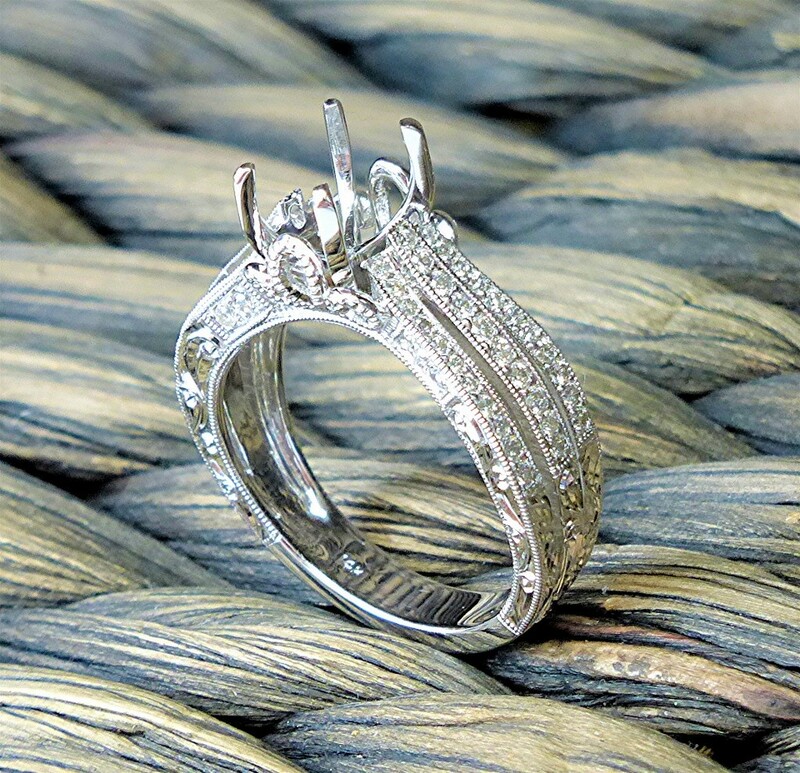 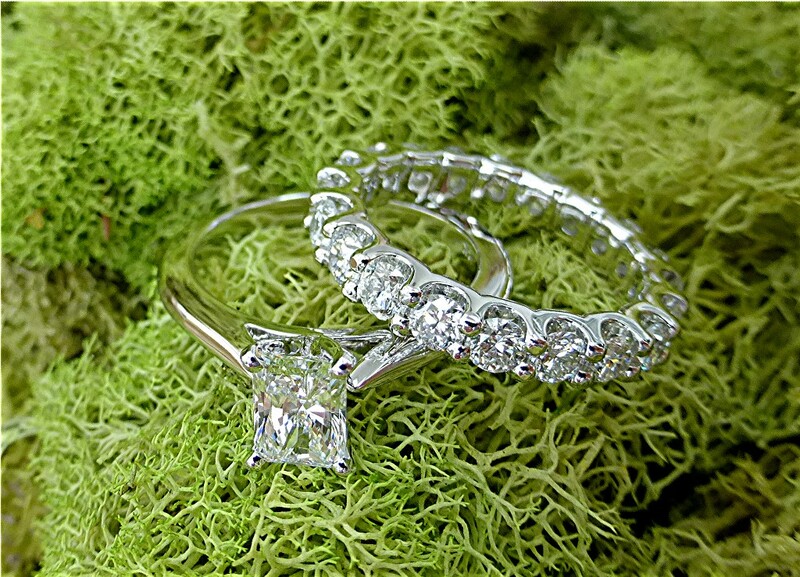 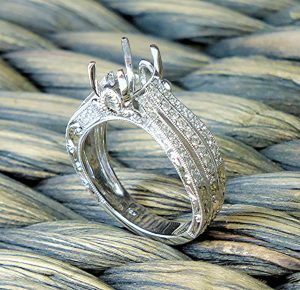 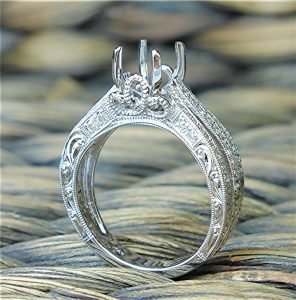 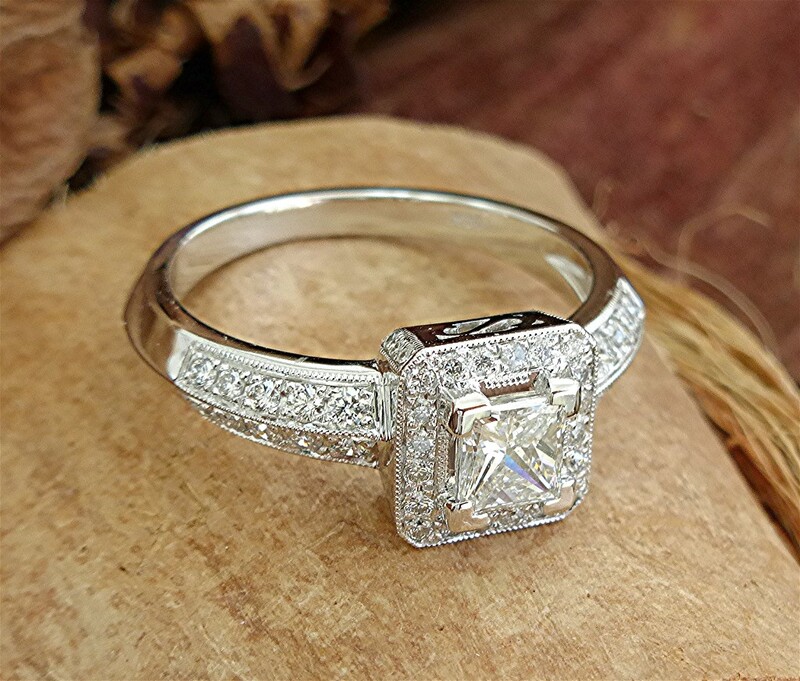 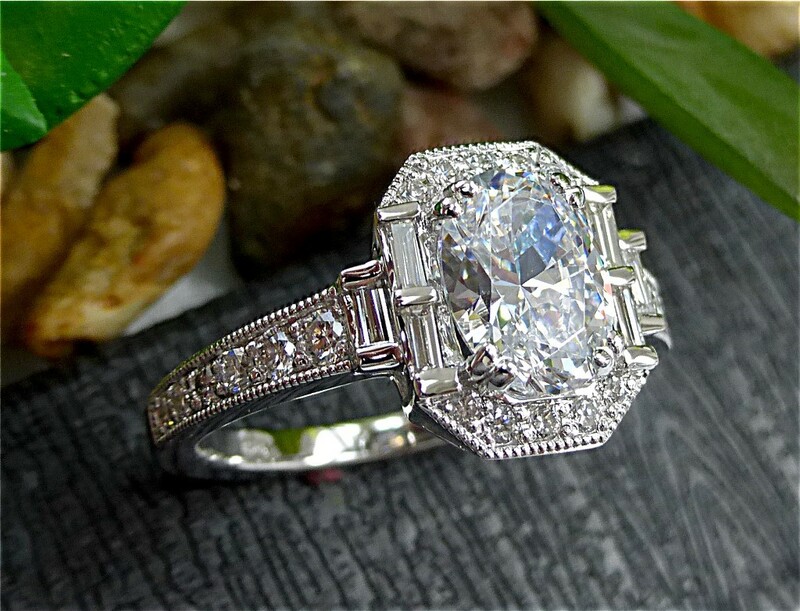 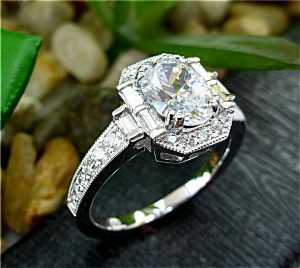 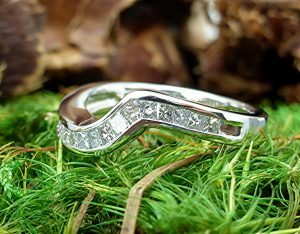 Triple row shank is pave set with diamonds. 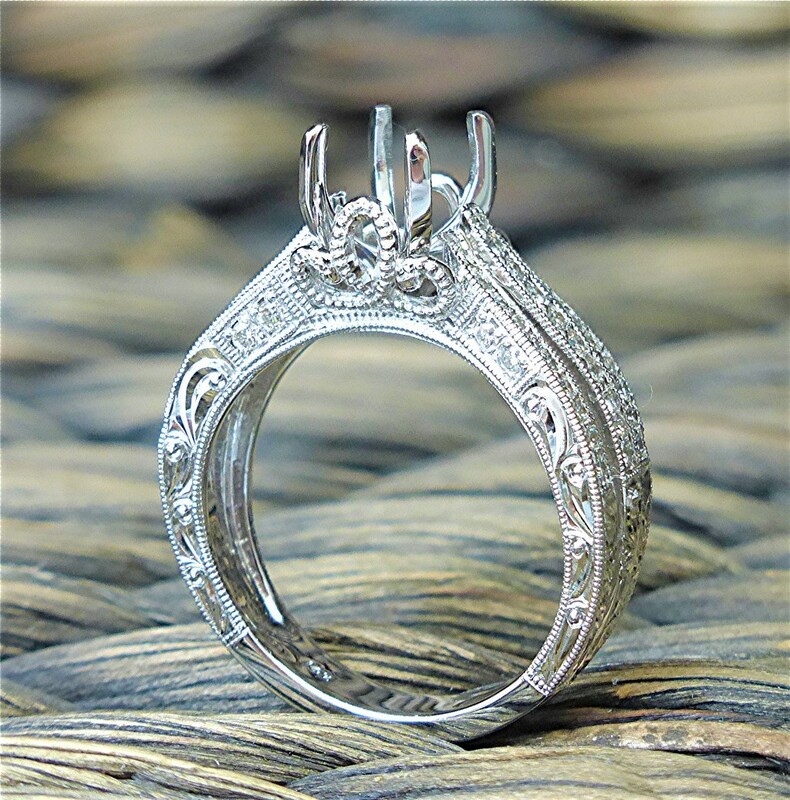 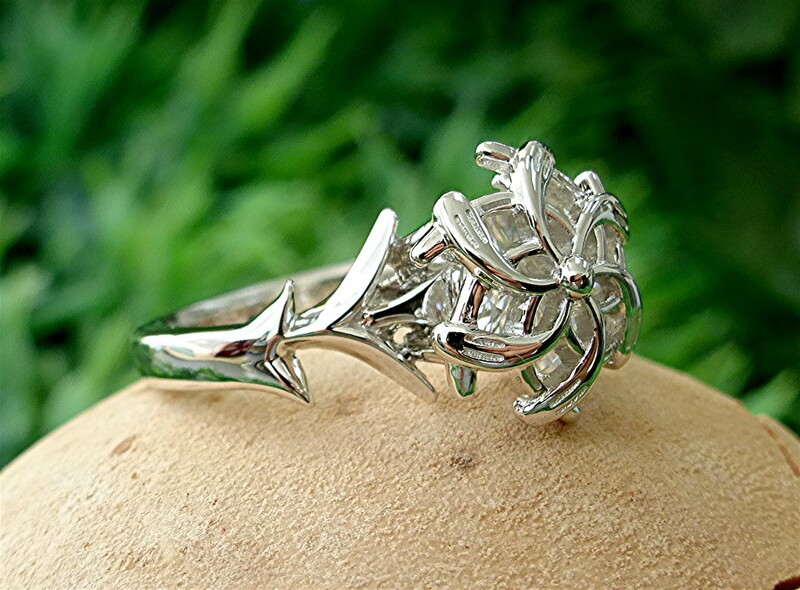 Side of the ring is hand engraved with scroll designs. 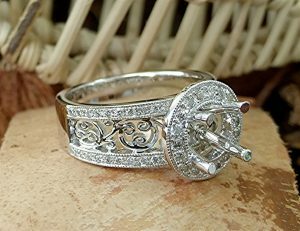 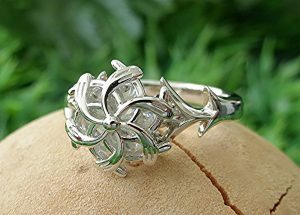 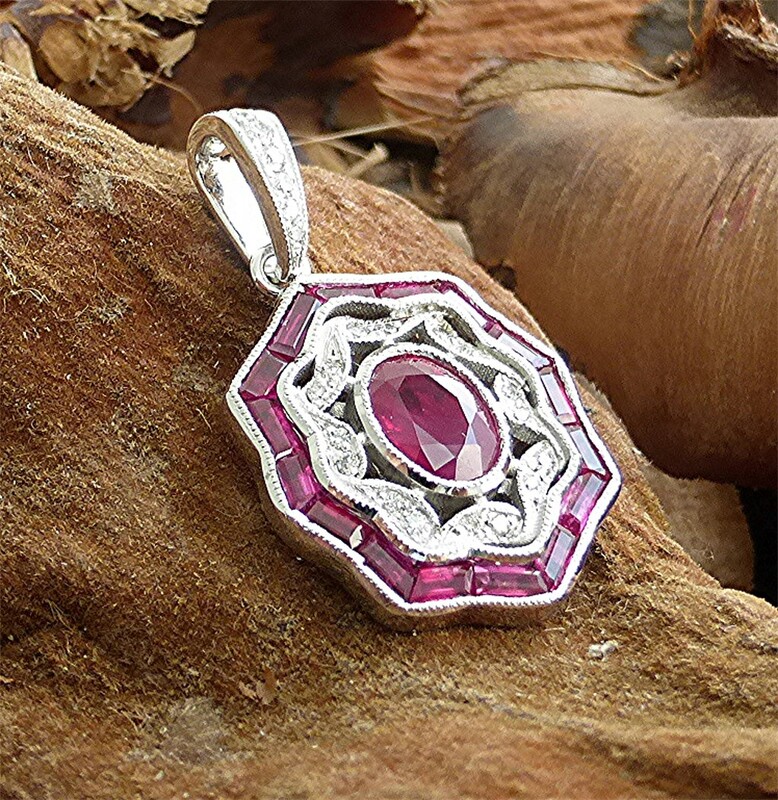 Made in 14k white gold.